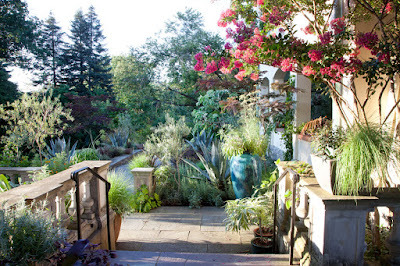 The Next Stage: Women and Retirement: I can’t believe this was my first visit to Chanticleer! I can’t believe this was my first visit to Chanticleer! I can’t believe this was my first visit to Chanticleer. For years I have been planning to go, but somehow never got it together. When my husband and I travel, I always make sure we make time for the great gardens of the places we visit. I can’t imagine a visit to London without going to Kew Gardens or to Berlin without the Botanical Gardens. But somehow I didn’t get it together to visit this incredibly beautiful garden right here in my own backyard. This is not a garden where I get ideas to introduce into my own garden. Chanticleer takes advantage of abundant sun and space, which I do not have. My wild garden is so crammed with plants that it would be a challenge to find room for something new and I sure don’t have the energy or inclination to rip up what I have. What I love about Chanticleer is the tranquility. The number of visitors is limited by the size of the parking lot and the website states:” Our parking lot holds 120 cars and can fill on weekends and Friday evenings. Please car pool and understand once we reach capacity, we will ask you to return another time.” There are no hordes of visitors disrupting the serenity at Chanticleer. I plan to become a member and visit as often as I can!